Throngs of native New Yorkers have never visited the Statue of Liberty. Or taken a ride on the Staten Island ferry. Many have been to Manhattan numerous times without ever seeing it from the top of the Empire State Building. Similarly, there are plenty of Long Island boaters who have taken trips to Atlantic City, cruised up the Hudson River, even gone as far as Florida, yet have rarely—if ever—explored the many historic, cultural and exciting locations in their own backyards. If you’ve got the boat, our Island makes it easy for singles, couples and families alike to enjoy a multitude of pleasures on both its northern and southern shores. There are many great destinations including Long Beach, Point Lookout, Connetquot River, Greenport, Stony Brook and Huntington, to name a few. Our picks are just the tip of the iceberg, but will keep you busy exploring all summer. 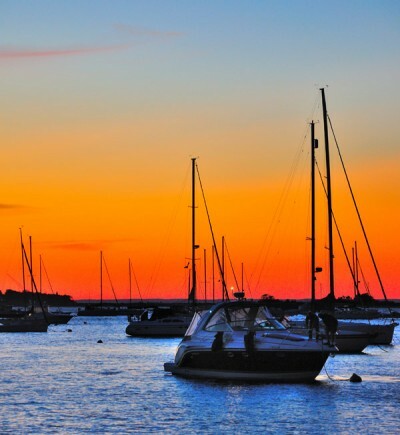 Just remember that Long Island’s many waterways have different navigational requirements and it’s important to know what to expect before making any trip. Using any popular search engine, it’s relatively easy to learn what you need. Also, it’s always advisable to check local marinas or dockage facilities before visiting to find out about space availability and size accommodations, as well as docking fees. It has been home to rough-riding President Teddy Roosevelt, piano man Billy Joel and one of the Northeast’s most rousing oyster festivals, yet Oyster Bay is also a place of quiet beauty and quaint charms. Heading into Oyster Bay Harbor, you can choose to anchor in Morris Cove, which has a depth of roughly eight feet and is less traveled than West Harbor. 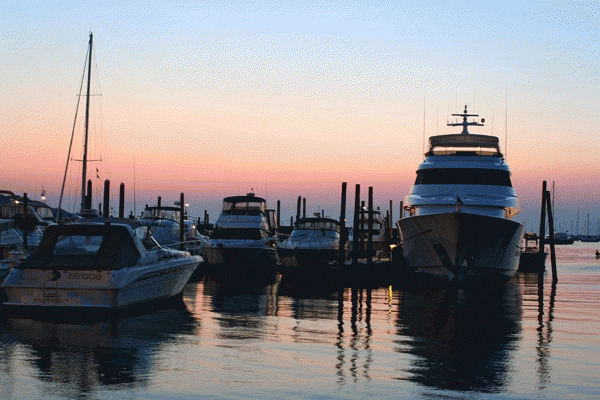 Just as pleasurable, you’ll find a number of marinas with docking for transient boaters at reasonable fees. If you have the time, it’s worth the walk into town to visit the numerous shops and enjoy one of several inviting cafés and restaurants. One walk you probably won’t want to miss is the Oyster Bay Art Walk, held the first Thursday of every month, where appreciative aficionados get to experience an international spectrum of contemporary works on display throughout the historic downtown area. Not planning to be around on Thursdays? Main Street in Oyster Bay is home to an abundance of treasures for art lovers of all tastes to enjoy every day. Perfect for a day trip or a weekend excursion, this delightful hamlet at the head of Oyster Bay, and just a few miles east of the aforementioned town, offers an abundance of historical and cultural wonders. Meander through several antique shops, the art glass and gift shop, see the custom doll houses on display in the general store and be sure to visit the famous Kiva Native American handcrafts shop. 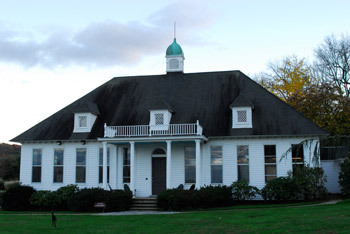 Cold Spring Harbor also boasts such unique attractions as its famous Whaling Museum, renowned Cold Spring Harbor Laboratory and the equally well-known Fish Hatchery and Aquarium. If you do make it into town, be sure to stop by Billy Joel Park with a good-size jug. At the entrance is a small black hose spouting some of the Island’s coldest, tastiest water non-stop—you’ll probably see many of the Long Islanders who make regular pilgrimages here to fill up. 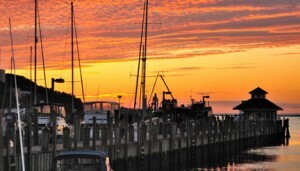 While generally considered an ideal stopover to and from such eastern locales as Montauk Point and Block Island, Port Jefferson’s town and waterfront make the town a great destination in its own right. Enjoy the great outdoors and people watching from arriving ferries as you sit for a delightful meal at one of the waterfront restaurants. Browse among the abundant shops, art galleries and boutiques. Or take in a show at the performing arts theater. The new Harborfront Park provides a wealth of recreational and social activities, as well as a play area for younger children. Another popular attraction is a walking tour through the town’s historic district, which brings to life the bygone era of Port Jefferson’s ship builders and captains. Those with adventurous culinary tastes—or food allergies—will want to check out the Tiger Lily Café, considered by many to be the region’s funkiest alternative vegetarian restaurant. Dairy-, wheat- and gluten-free options are available for those with dietary sensitivities, as well as an ample assortment of non-vegetarian dishes. Saunter into the Juice Bar for a soy smoothie or protein shake or the Java Bar for such exotic delights as Mocha Blanca and Tahitian Vanilla Chai. Local legend has it PT Barnum himself was such a frequent visitor to the Port Jefferson area—he started the ferry to and from his home in Bridgeport, CT. One visit and you’ll understand why he came so often. For the boating family, Montauk is truly a “do-it-all” vacation spot, whether for one day or several. While the world-famous Montauk Point Lighthouse and Museum is the best-known attraction, residents and regulars also take great pride in the town’s reputation as the sportfishing mecca of the Northeast. Big game—such as tuna, marlin, and sharks—abound in the waters, and both private charters and party-fishing excursions are readily available. Not into fishing? 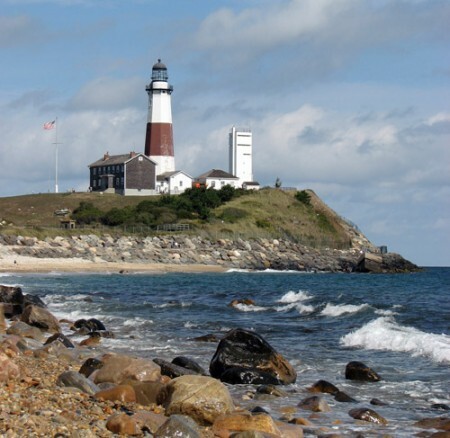 Then sprawl out or stroll along Montauk’s miles of beautiful ocean beaches. Explore Hither Hills State Park or one of the five state, county and town parks. At Montauk Point State Park, you can take a guided tour to see as many as four species of wintering seals, as well as diverse bird populations and other marine wildlife. After your brisk walk, indulge yourself at Gurney’s Inn and Seawater Spa, the only true thalassic spa in the US. 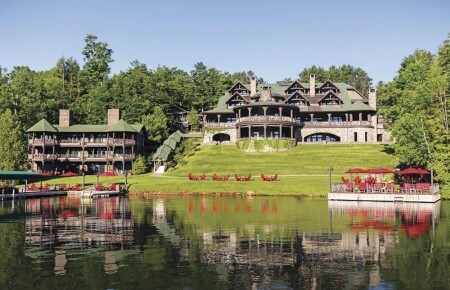 There’s so much to enjoy all day, including kayaking, surfing, golf, horseback riding and more. The kids will adore the baby animals at Rita’s Stable Petting Farm, as well as the over-600 daylilies in bloom at Montauk Gardens. However, when the sun goes down, things really start heating up, nowhere more so than the Backyard at Sole East restaurant and bar, just a half-mile or so outside the Village proper. From the “Flying Buffet” Happy Hour and Sunday Jazz Brunches to their famous Burlesque Show, there’s never a dull moment here. Nestled between the North and South Forks, and surrounded by three bays, Shelter Island is 8,000 acres of sheltered paradise, first settled by rich European sugar merchant Nathaniel and his wife Grissel Sylvester in 1652 (she was just 16 at the time). Today, a lot of the natural beauty they encountered is still present, nowhere more so than the magnificent Mashomack Preserve, which encompasses more than one-quarter of the Island and is run by The Nature Conservancy. Tours are available or you can hike through the Preserve at your leisure. For the visiting boater, Shelter Island offers an idyllic retreat from civilization as most know it. Many enjoy the simple beauty of Coecles Harbor—one of the East End’s most protected harbors—on the Island’s eastern side. It’s also a great place to observe nesting ospreys and other avian life. Natural artistry coexists harmoniously with the numerous man-made galleries. History buffs can take a step back in time with a tour of The Heights, where they can also meet several descendants of families who lived here during the American Revolution. There are numerous man-made wonders to see as well, from the metal sculptures of native artist/blacksmith Hap Bowditch Jr. and paintings by Louise Tuthill Green’s to Barbara Wright’s functional stoneware and porcelain sculptures at Shelter Island Pottery. Antiquing is also a popular Shelter Island pastime, which many follow-up with dinner at Sweet Tomato’s, Ram’s Head Inn or the Vine Street Café. Those looking for quality seafood in a more laid-back atmosphere may want to travel slightly farther to visit Two Ed’s restaurant. No cars. No cares. No wonder Fire Island has been revered by beach-goers, water sport enthusiasts and lovers of the great outdoors as the ultimate vacation getaway. And why not? It boasts miles of pristine beaches. Boating and sailing along a 101-mile coastline. And everything from biking and hiking to fishing, clamming and kayaking. Not to mention some of the best surfing on the Northeastern seaboard…year-round! Camping is relaxed and robust at the Smith Point and Watch Hill campsites, the latter offering 26 sites with grills, picnic tables, and the ocean and bay nearby, as well as a quiet, family-oriented marina. A genuine boater’s community, Davis Park—only one mile from Watch Hill—provides beautiful beachfront, and great fun and camaraderie at its main restaurant/bar. Those seeking a nightlife of boisterous dancing and never-ending house parties gravitate toward Kismet, the westernmost party hub. The Surf’s Out restaurant (formerly The Out) is Kismet’s premier waterfront dining and dancing spot. However, the greatest concentration of bars, restaurants and shopping opportunities resides in Ocean Beach, Fire Island’s unofficial capital. You can pull up in your boat for a sumptuous lunch, complete with a stunning view of Great South Bay, at the Island Mermaid. And anyone with a sweet tooth won’t want to leave the Island without a strudel stick or any of the mouth-watering cakes that have made Rachel’s Bake Shop famous. Day-trippers also make a point to visit Sailors Haven, which provides a lovely public beach and access to the Sunken Forest. Recently renovated and revitalized, the Nautical Mile in Freeport is a fantastic place to enjoy afternoons on the water. 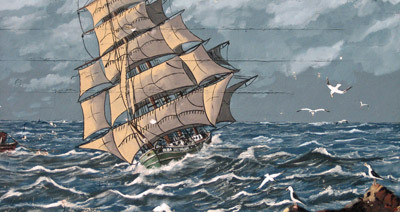 Even though it’s really about three-quarters of a mile, this bustling thoroughfare, the unofficial nickname for Woodcleft Avenue, greets visitors with a unique blend of nautical flair and street fair exuberance, flooding the senses with the sights, sounds and flavors of the sea. With so many tempting culinary treats to sample, lunch or dinner on the Nautical Mile is an experience not to be missed, not only for the food but also for the live music at most eateries. Waterside dining is abundant, with dockage available at several establishments, including Margo & Frank’s Mermaid. One of the hottest spots on “the Mile” is Otto’s, run by the same family for 80 years and the chosen hangout of “Rocky The Dancer.” Just off the Nautical Mile, families can sample Portuguese and Mediterranean cuisine while overlooking the Hudson Canal at Pier 95. Adults can enjoy a lively bar scene, complete with an outdoor raw bar at LandShark or genuine pub atmosphere at Jeremy’s Ale House. Those females who dare can enjoy free beer all night by donating their bra to the House’s hanging collection. And if you want to bring some of the flavor back to your boat, there are three fish markets with an almost endless list of seafood delicacies. There are several gift shops to browse through, festivals to attend, and both fishing charters and casino boats for those seeking more adventurous pastimes.